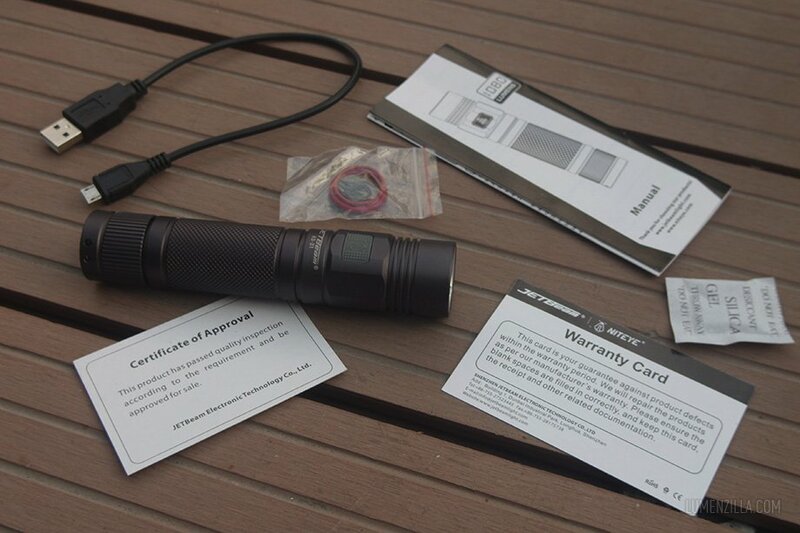 JetBeam KO-01 is a 1080 lumens tubular flashlight with side switch designed for outdoor activity. 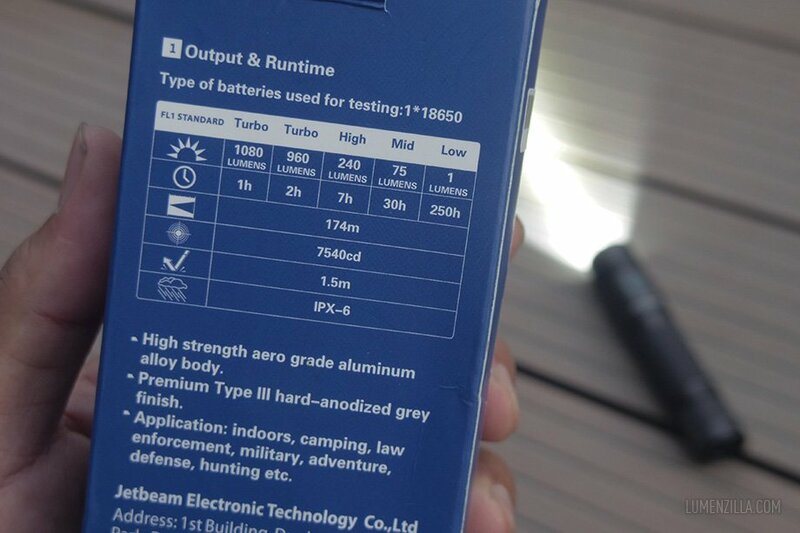 It has internal charging feature that allows us to charge the included 18650 battery via micro USB port. A charging cable (USB to micro USB) is also included. 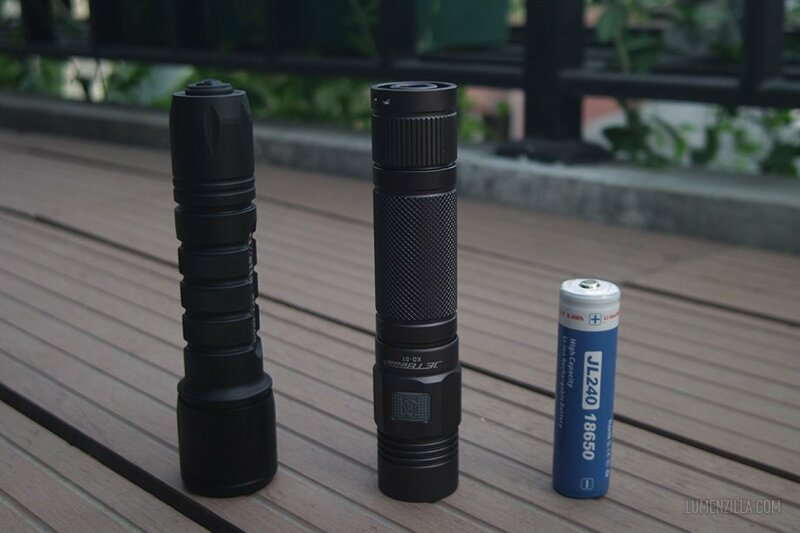 This flashlight might also available under the brand Niteye with the same model number and specification. JetBeam KO-01 has four brightness levels with strobe mode hidden and has max 170 meters beam distance. 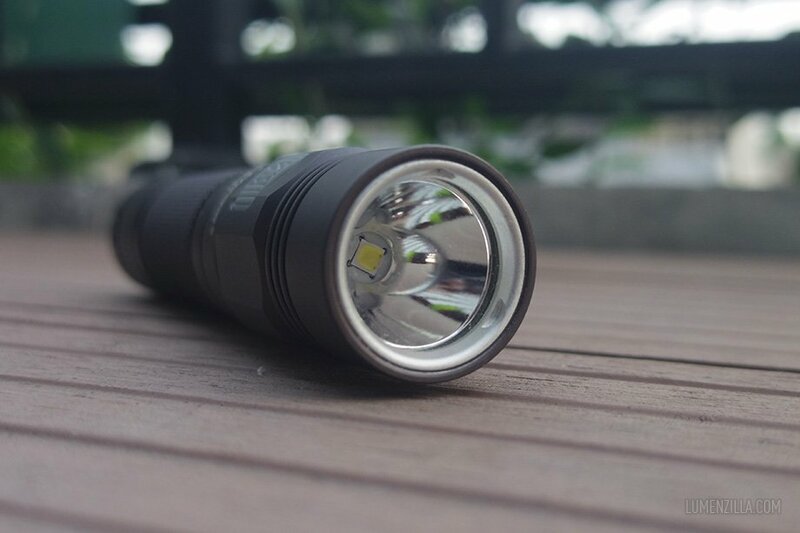 By using XP-L LED, 1080 lumens is seem too low compared to most flashlights nowadays but it sure gives fairly longer runtime thus suitable for outdoor activities. It also has nice color anodizing similar to other JetBeam’s Jet series model. They called it “grey” but I think it’s tend to brown-ish instead of grey. JetBeam KO-01 is designed in a classic tubular style with side switch and USB charging capability. To avoid common problem in tubular shaped flashlight, JetBeam cleverly adds an anti rolling design on the head part. 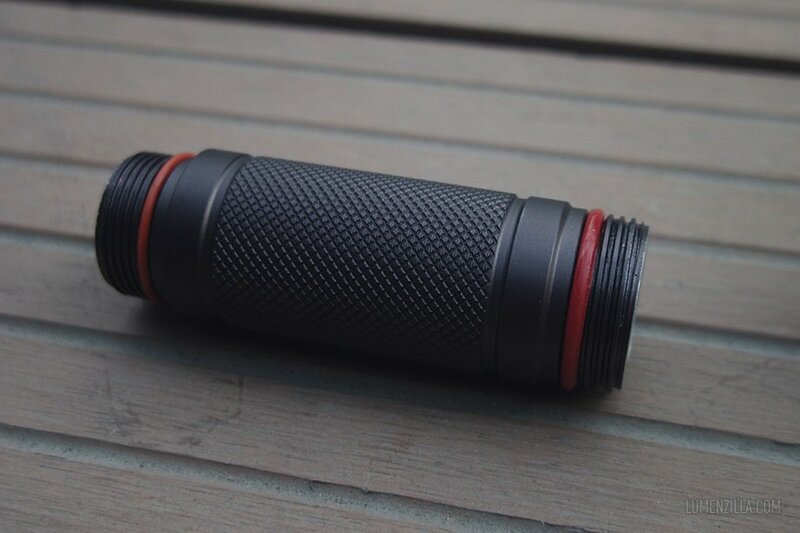 The design is very effective and I found the torch will stay on desk without any need of pocket clip to keep it stays. 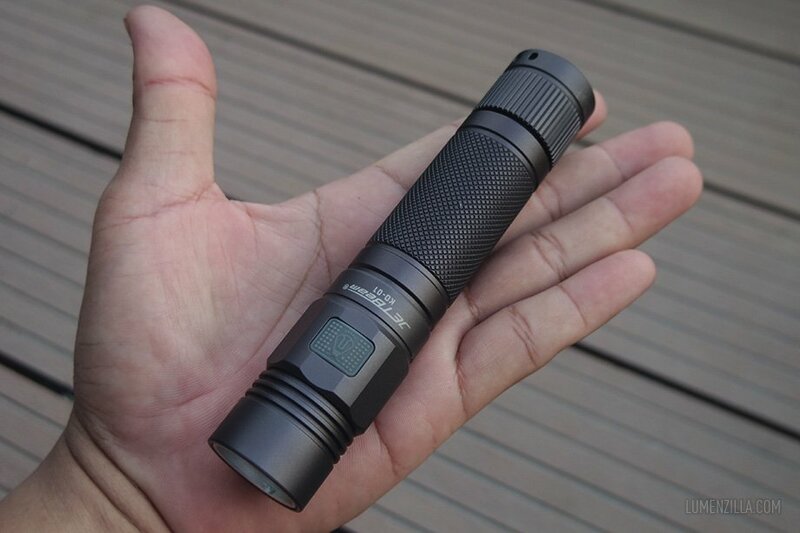 Talking about dimensions, JetBeam KO-01 length is somehow longer than any other 18650 flashlights despite it is using side switch. 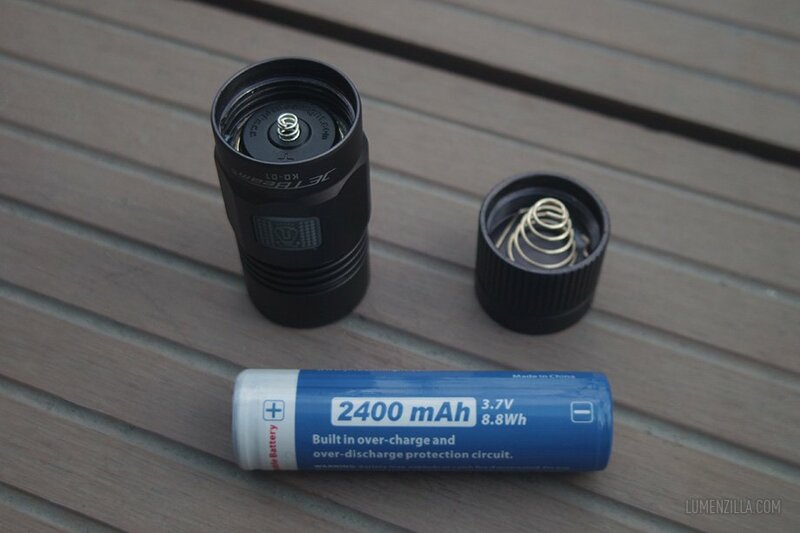 Here’s a comparison of Elzetta and JetBeam KO-01 with the included 2400 mAh 18650 battery. There was a plastic sheet inserted between the negative pole of the battery and the spring –it’s not pictured– to avoid accidental operation during the transport. The body part has smooth and non aggressive knurlings with square threads on both ends. The thread widths and diameters on both ends are different so it can’t be installed in reversed order. On its tail cap, there are tiny holes used to attach lanyard and a big slot for installing optional lanyard ring which is sold separately and not included in the package. 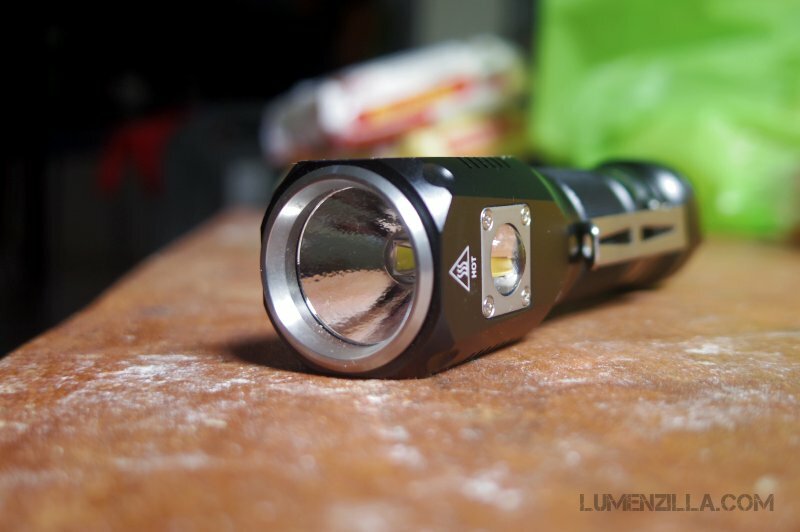 I think JetBeam can improve this part to shorten the length of flashlight. JetBeam KO-01 has four brightness levels with one hidden strobe. 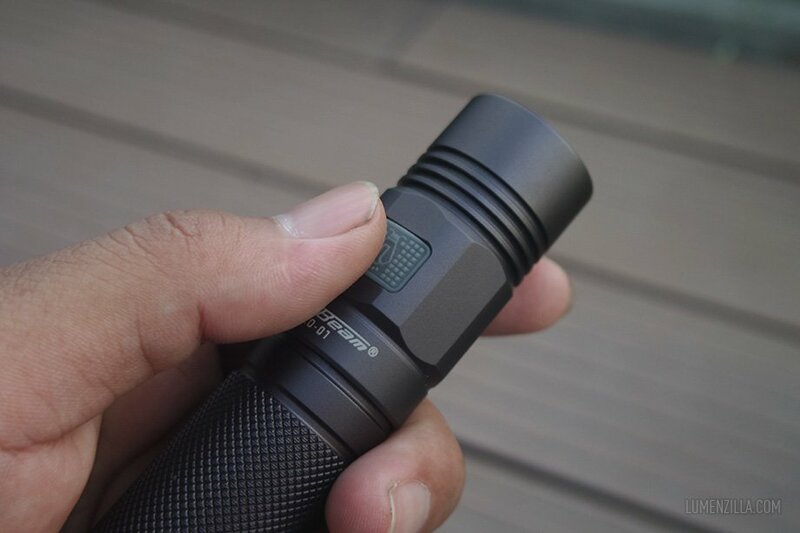 Operating the flashlight is easy by using the side switch. First mode was Turbo at 960 lumens and will drop into High at 240 lumens when the circuit protection is kicking. 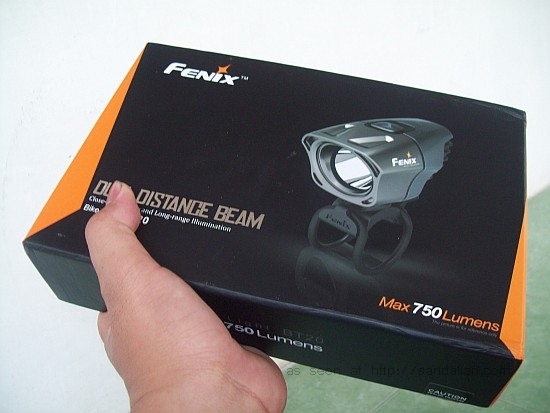 Clicking the switch will change the level into Medium at 75 lumens and Low at 1 lumen. I found that 1080 lumens output is only possible when using 2xCR123 (6 volts) and the Low mode is seem more than 1 lumen. It has smooth ramping operation when changing brightness levels which is nice and comfy to users’ eyes. With memory feature, JetBeam KO-01 will remember the last brightness level used. The rubber side switch is quite comfortable and a spare rubber switch cover is also included. The blue LED beneath the rubber switch will blink slowly when the battery drops bellow 50% of capacity and blinking faster when the battery is under 10%. On the opposite position of the switch, there’s a micro USB charging port. While charging, the LED beneath the rubber switch will constantly light. JetBeam KO-01 is equipped with smooth reflector and the lens is secured with metal bezel. There are notches on the bezel. I think simple LED swap modification wouldn’t be very difficult. 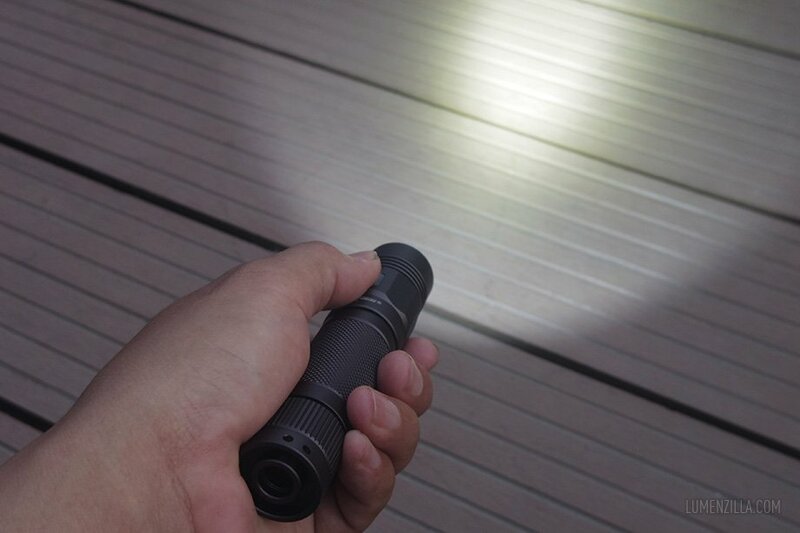 JetBeam KO-01 is a flashlight designed for outdoor activity by using the benefit of smooth reflector and nice mode spacing. 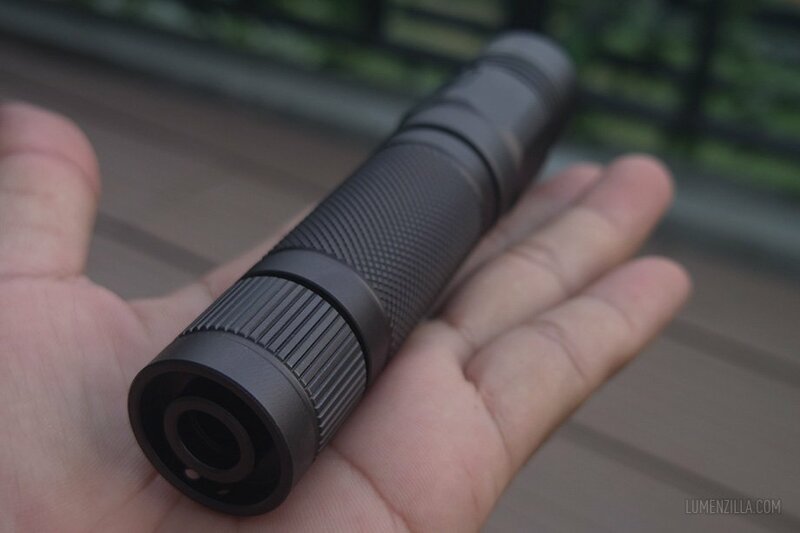 Internal charging feature might come handy when carrying this flashlight to go outdoor. There are some minor issue with the design but it won’t affect its functionality. 2400 mAh battery is included. Decent build quality and materials. Smooth reflector for throwy beam profile. Nice Jet series coating color. 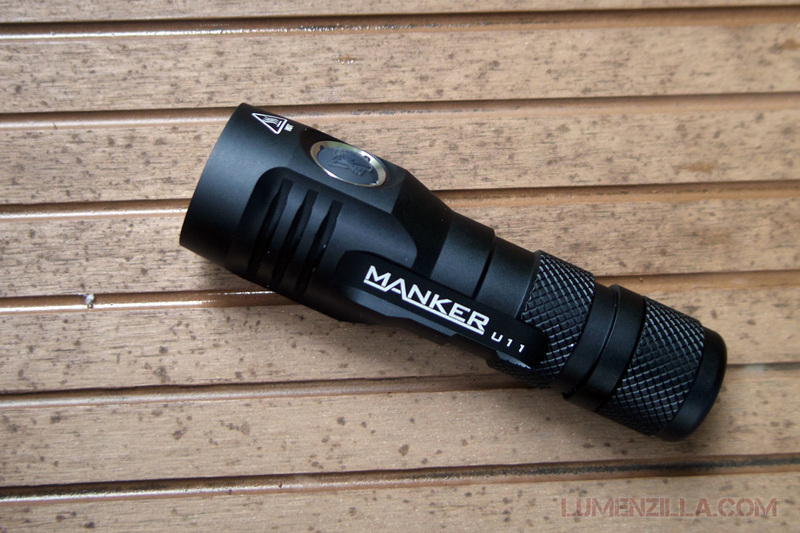 Advertised 1080 lumens only possible by using 2xCR123 (primary battery). Low mode seems a bit higher than advertised 1 lumen. 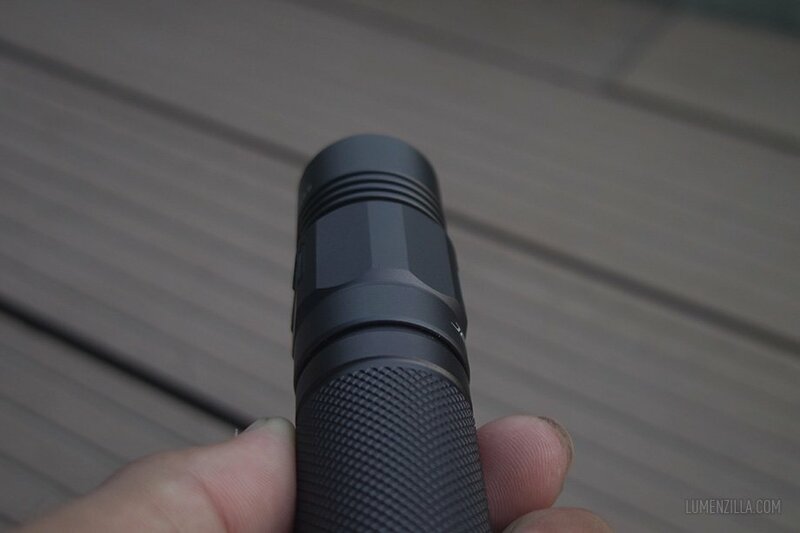 Tail cap design can be improved to shorten the flashlight length. Optional lanyard ring is not included.